Comments - Terrific image of the infamous bandit Kumasaka Chohan and his gang of thieves gathered beneath an enormous pine tree that served as their lookout. 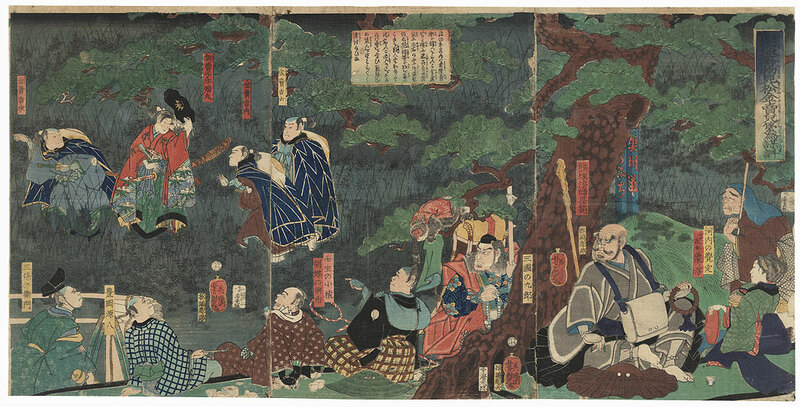 At left, the young Ushiwakamaru, who will grow up be the renowned swordsman Minamoto no Yoshitsune, is shown traveling through the woods with three men accompanying him. He will later encounter Chohan and his rogues robbing the inn as Akasaka post station, where he will defeat the elder man with his martial arts skills. Here, Chohan leans against the tree trunk at right, scowling unhappily, a string of prayer beads in his hand. 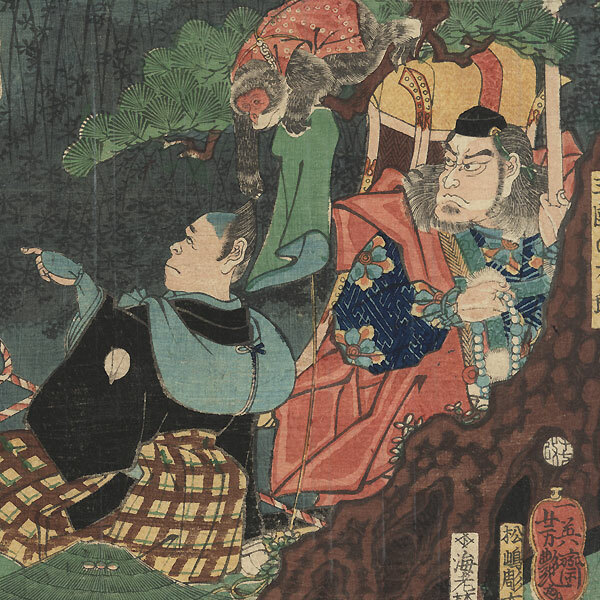 In the center, a mischievous monkey leans down from a branch to grab his startled trainer's topknot. An intriguing design with interesting characters and an atmospheric night setting among the tall grasses. 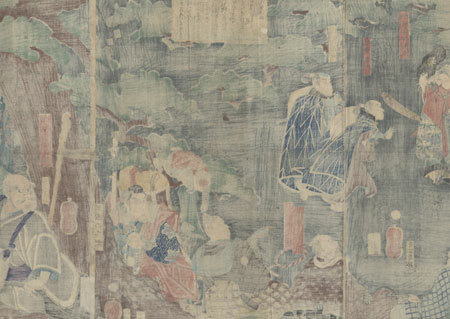 The Boston Museum of Fine Arts has this image in its collection. Condition - This print with excellent color and detail as shown. Horizontal centerfold. Three attached panels. Small thinning spot, a few small holes, repaired. Slight toning and soiling, a few creases, slight rubbing at edges, a few small stains. Please see photos for details. Good overall.